Giovanni Graziadio began studying recorder as an autodidact when he was seven years old. He received his undergraduate degree on recorder with highest honors, at the Early Music Department of the Music Conservatory of Cosenza S. Giacomantonio. At the same school, he studied recorder with Piero Cartosio, Pietro Meldolesi, Stefano Bagliano and Tommaso Rossi, and baroque traverso with Laura Pontecorvo. 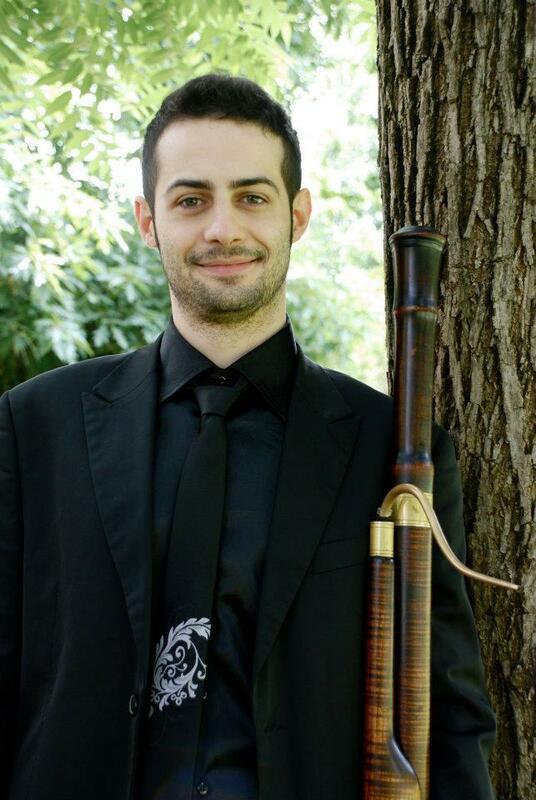 He studied period bassoons with Maurizio Barigione, Giorgio Mandolesi and Alberto Grazzi, attending academic courses, seminars and masterclasses. At the Schola Cantorum Basiliensis, he completed master studies in both performance practice and pedagogy on historical bassoon with Donna Agrell. Giovanni played in the most important festivals and concert halls of Europe, as a soloist and as an ensemble member with groups such as “Concerto Romano”, “Il Complesso Barocco/A. Curtis”, “I Barocchisti” from Lugano (CH), “Coin du Roi – Société d’Opéra”, the Baroque Orchestra “ORFEO FUTURO”, “Accademia Musicale dell’Annunciata”, “Stile Galante”, “Academia Montis Regalis”, “Accademia degli Astrusi”, Baroque Ensemble of the Association for Music “Antonio Il Verso” from Palermo, “Collegium Pro Musica”, “Ensemble Barocco del Conservatorio di Cosenza”, “Festa Rustica”,”Camerata Artemisia Gentileschi”, “Canal Grande” – Adriatic Baroque Orchestra, “Lautten Compagney” from Berlin, Freiburger Barockorchester, Orchestra “La Scintilla” (CH), “La Cetra” Barockorchester (CH). He is a founding member of both ensembles “Abchordis”, with whom he performs throughout Europe, and “The Italian Consort”, specializing in Renaissance music. He was selected by the Baroque Académie Européene of Ambronay 2011 and was bassoon player of the Jeune Orchestre Atlantique of Saintes (April, 2012), as well as bassoon player in the Theresia Youth Baroque Orchestra 2014. He has performed several times in live broadcasts on the Vatican Radio, and also in direct broadcasts from the prestigious German radio station WDR and Radio ORF from the Wiener Konzerthaus. From 2006 until nowadays, he has recorded over fourteen CDs published by several labels such as RADICI MUSIC, FINEDIT SRL, Digressioni Contemplattive, Christophorus Records (MusiContact-group), Pan Classics, Sony DHM, Glossa, Erato, Egea Music. He presented his first studies about the use of bassoon in Naples between XVII and XVIII century, at the “XXIII Convegno Annuale della Società Italiana di Musicologia – Conservatorio di musica “G. Verdi” of Como (IT). He is now a researcher of the Schola Cantorum Basiliensis (Basel, Switzerland) working on the project “Fagottini and Tenoroons” (project founded by the Swiss National Science Foundation) and a PhD student at the University of Basel.